Tickets for DCI Atlanta, the Southeastern Championship are now on sale through Ticketmaster. 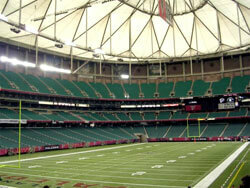 The Georgia Dome is the newest major event venue on the 2006 Summer Music Games Tour. Held on July 29, one ticket gives you access to two big shows in one excitement-filled day. The early show starts at noon, and the evening show starts at 7 p.m.